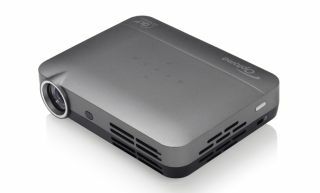 Optoma unveils ultra-compact Android LED projector | What Hi-Fi? Integrated wi-fi and smart Android interface mean the little ML330 is big on convenience. Optoma has taken the covers off its new ML330 LED projector. It's a tiny thing by projector standards - just 4 x 16 x 13cm (hwd) - and weighs 460g, so it's eminently portable. Aside from its go-anywhere appeal, the ML330 has all-in-one credentials too. It has integrated wi-fi and is running Android 4.4 - so download content apps like Netflix or YouTube, adjust the volume (the ML330 has a 2-watt speaker) and you're ready to go. All you need is a screen or a wall to project onto. Native resolution is 1280 x 800, so the default aspect ratio is 16:10. Physical inputs include HDMI, two USB-A and a 3.5mm analogue socket. It's also packing Bluetooth, so connecting speakers or headphones wirelessly is on the menu too. It supports 3D content - though the glasses are a cost option - and there's a remote control as well. The ML330 is on sale now and costs £400.